Kazakhstan, also spelled Kazakstan or Khazakhstan, ( Kazakh: Қазақстан, Qazaqstan, IPA [qɑzɑqˈstɑn]; Russian: Казахстан, Kazakhstán, IPA [kəzʌxˈstan]), officially the Republic of Kazakhstan, is a country that stretches over a vast expanse of northern and central Eurasia. A small portion of its territory west of the Ural River is located in eastern-most Europe. It has borders with Russia, the People's Republic of China, and the Central Asian countries Kyrgyzstan, Uzbekistan and Turkmenistan, and has a coastline on the Caspian Sea. Kazakhstan was a republic of the former Soviet Union and is now a member of the Commonwealth of Independent States. It is the ninth-largest country in the world by area, but it is only 62nd country in population, with approximately 6 persons per km² (15 per sq. mi.). Population in 2006 is estimated at 15,300,000, down from 16,464,464 in 1989 due to the emigration of ethnic Russians and Volga Germans. Much of the country's land consists of semi-desert ( steppe) terrain. Humans have inhabited what is now known as Kazakhstan since the Stone Age, generally pursuing the nomadic movement pastoralism for which the region's climate and terrain are best suited. In fact, historians believe the vast steppes of modern day Kazakhstan were where humans first domesticated the horse. From the 4th century through the beginning of the 7th century, southern parts of the territory of what is now Kazakhstan were a part of and ruled by the Persian Empire, and after the invasion of Persia by Arabs, ruled by a few nomadic kingdoms . Following the Mongolian invasion in the early 13th century, administrative districts were established under the Mongol Empire, which eventually became the territories of the Kazakh Khanate (Ak Horde). The major medieval cities of Aulie-Ata and Turkestan were founded along the northern route of the Great Silk Road during this period. Traditional nomadic life on the vast steppe and semi-desert lands was characterized by a constant search for new pasture to support the livestock-based economy. The Kazakhs emerged from a mixture of tribes living in the region in about the 15th century and by the middle of the 16th century had developed a common language, culture, and economy. In the early 1600s, the Kazakh Khanate separated into the Great, Middle and Little (or Small) Hordes (jüz)—confederations based on extended family networks. Political disunion, competition among the hordes, and a lack of an internal market weakened the Kazakh Khanate. The beginning of the 18th century marked the zenith of the Kazakh Khanate. The area was a bone of contention between the Kazak emirs and the Persian Kings for many centuries. In the nineteenth century, the Russian Empire began to expand, and spread into Central Asia. The " Great Game" period is generally regarded as running from approximately 1813 to the Anglo-Russian Convention of 1907. Following the Bolshevik Revolution of 1917 a second less intensive phase followed. The tsars effectively ruled over most of the territory belonging to what is now the Republic of Kazakhstan. The Russian Empire introduced a system of administration and built military garrisons and barracks in its effort to establish a presence in Central Asia in the so-called " Great Game" between it and the United Kingdom. Russia enforced the Russian language in all schools and governmental organizations. Russian efforts to impose its system aroused the resentment of the Kazakh people, and by the 1860s, most Kazakhs resisted Russia's annexation largely because of the disruption it wrought upon the traditional nomadic lifestyle and livestock-based economy. The Kazakh national movement, which began in the late 1800s, sought to preserve the Kazakh language and identity. From the 1890s onwards ever-larger numbers of Slavic settlers began colonising the territory of present-day Kazakhstan, in particular the province of Semirechie. The number of settlers rose still further once the Trans-Aral Railway from Orenburg to Tashkent was completed in 1906, and the movement was overseen and encouraged by a specially created Migration Department (Переселенческое Управление) in St. Petersburg. The competition for land and water which ensued between the Kazakhs and the incomers caused great resentment against colonial rule during the final years of tsarist Russia, with the most serious uprising, the Central Asian Revolt, occurring in 1916. Soviet repression of the traditional elite, along with forced collectivization in late 1920s-1930s, brought mass hunger and led to unrest. Soviet rule, however, took hold, and a communist apparatus steadily worked to fully integrate Kazakhstan into the Soviet system. Kazakhstan experienced population inflows of thousands exiled from other parts of the Soviet Union during the 1930s and later became home for hundreds of thousands evacuated from the Second World War battlefields. Some of these evacuees were deported to Siberia or Kazakhstan merely due to their ethnic heritage or beliefs, and were in many cases interned in some of the biggest Soviet labor camps. The Kazakh Soviet Socialist Republic (SSR) contributed five national divisions to the Soviet Union's World War II effort. The period of World War II marked an increase in industrialization and increased mineral extraction in support of the war effort. At the time of Soviet leader Joseph Stalin's death, however, Kazakhstan still had an overwhelmingly agricultural-based economy. In 1953, Soviet leader Nikita Khrushchev initiated the ambitious " Virgin Lands" program to turn the traditional pasturelands of Kazakhstan into a major grain-producing region for the Soviet Union. The Virgin Lands policy, along with later modernizations under Soviet leader Leonid Brezhnev, sped up the development of the agricultural sector, which to this day remains the source of livelihood for a large percentage of Kazakhstan's population. Growing tensions within Soviet society led to a demand for political and economic reforms, which came to a head in the 1980s. In December 1986, mass demonstrations by young ethnic Kazakhs took place in Almaty to protest the methods of the communist system. Soviet troops suppressed the unrest, and dozens of demonstrators were jailed or killed. In the waning days of Soviet rule, discontent continued to grow and find expression under Soviet leader Mikhail Gorbachev's policy of glasnost. Caught up in the groundswell of Soviet republics seeking greater autonomy, Kazakhstan declared its sovereignty as a republic within the Union of Soviet Socialist Republics in October 1990. Following the August 1991 abortive coup attempt in Moscow and the subsequent dissolution of the Soviet Union, Kazakhstan declared independence on December 16, 1991. The years following independence have been marked by significant reforms to the Soviet command-economy and political monopoly on power. Under Nursultan Nazarbayev, who initially came to power in 1989 as the head of the Kazakh Communist Party and was eventually elected President in 1991, Kazakhstan has made significant progress toward developing market economy. The country has enjoyed significant economic growth since 2000, partly due to its large oil, gas, and mineral reserves. But, democracy has not improved much since 1991. 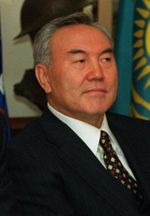 An article from World War 3 web site says "In July 2000, Kazakhstan's parliament passed a law granting President Nursultan Nazarbayev lifetime powers and privileges, including access to future presidents, immunity from criminal prosecution, and influence over domestic and foreign policy. Critics say he has become a de facto "president for life." (Central Asia-Caucasus Institute briefing, July 5, 2000, ). Over the course of his ten years in power, Nazarbayev has repeatedly censored the press through arbitrary use of "slander" laws (RFE Newsline, April 12, 1996), blocked access to opposition web sites (Nov. 9, 1999), banned the Wahhabi religious sect (Sept. 5, 1998), drawn criticism from Amnesty International for excessive executions following specious trials (March 21, 1996) and harsh prison conditions (Aug. 13, 1996), and refused demands that the governors of Kazakhstan's 14 oblasts be elected, rather than appointed by the president (April 7, 2000)." Kazakhstan is a constitutional republic with a strong presidency. The president is the head of state. The president also is the commander in chief of the armed forces and may veto legislation that has been passed by the Parliament. President Nursultan Nazarbayev, who has been in office since Kazakhstan became independent, won a new 7-year term in the 1999 election that the Organization for Security and Cooperation in Europe said fell short of international standards. The prime minister chairs the Cabinet of Ministers and serves as Kazakhstan's head of government. There are three deputy prime ministers and 16 ministers in the Cabinet. Daniyal K. Akhmetov became the Prime Minister in June 2003. Kazakhstan has a bicameral Parliament, made up of the lower house (the Majilis) and upper house (the Senate). Single mandate districts popularly elect 67 seats in the Majilis; there also are ten members elected by party-list vote rather than by single mandate districts. The Senate has 39 members. Two senators are selected by each of the elected assemblies ( Maslikhats) of Kazakhstan's 16 principal administrative divisions (14 regions, or oblasts, plus the cities of Astana and Almaty). The president appoints the remaining seven senators. Majilis deputies and the government both have the right of legislative initiative, though the government proposes most legislation considered by the Parliament. 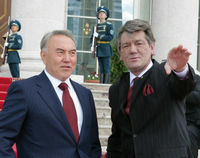 Elections to the Majilis in September 2004 yielded a lower house dominated by the pro-government Otan party, headed by President Nazarbayev. Two other parties considered sympathetic to the president, including the agrarian-industrial bloc AIST and the Asar party, founded by President Nazarbayev’s daughter, won most of the remaining seats. Opposition parties, which were officially registered and competed in the elections, won a single seat during elections that the Organization for Security and Cooperation in Europe said fell short of international standards. On December 4, 2005, Nursultan Nazarbayev was reelected in a landslide victory. The electoral commission announced that he had won over 90% of the vote. The Organization for Security and Cooperation in Europe (OSCE) concluded the election did not meet international standards despite some improvements in the administration of the election. Xinhua News Agency reported that Chinese observers, responsible in overseeing 25 polling stations in Astana, found that voting in those polls was conducted in a "transparent and fair" manner. Furthermore, Western governments were muted in their criticism of the election. Kazakhstan's National Security Committee (KNB) was established on 13 June 1992. It includes the Service of Internal Security, Military Counterintelligence, Border Guard, several Commando units, and Foreign Intelligence (Barlau). The latter is considered by many as the most important part of KNB. Its director is Major General Omirtai Bitimov. 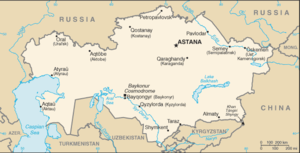 Kazakhstan is divided into fourteen provinces (oblys) and three municipal districts (qala)*: Taldy-Korgan, Almaty*, Aqmola ( Astana), Aqtöbe, Astana*, Atyrau, Batys Qazaqstan ( Oral), Bayqongyr*, Mangghystau ( Aqtau; formerly Shevchenko), Ongtustik Qazaqstan ( Shymkent), Pavlodar, Qaraghandy, Qostanay, Qyzylorda, Shyghys Qazaqstan ( Oskemen; formerly Ust'-Kamenogorsk), Soltustik Qazaqstan ( Petropavl), Zhambyl ( Taraz; known as Dzhambul in the Soviet period, but before that as Aulie-Ata). Note: Administrative divisions have the same names as their administrative centers (exceptions have the administrative centre name following in parentheses); in 1995 the Governments of Kazakhstan and Russia entered into an agreement whereby Russia would lease for a period of 20 years an area of 6,000 square kilometres (2,300 sq. mi); enclosing the Bayqongyr (Baykonur) space launch facilities and the city of Bayqongyr (formerly Leninsk). Just recently, the lease of Bayqongyr facilities was extended through 2050. Each is headed by an Akim (provincial governor) appointed by the president. Municipal Akims are appointed by oblast Akims. The Government of Kazakhstan transferred its capital from Almaty to Astana on December 10, 1997. With an area of 2.7 million square kilometers (1.05 million sq. mi), Kazakhstan is the ninth-largest nation in the world. It is equivalent to the size of Western Europe. It shares borders of 6,846 kilometers (4,254 mi) with Russia, 2,203 kilometers (1,369 mi) with Uzbekistan, 1,533 kilometers (953 mi) with the People's Republic of China, 1,051 kilometers (653 mi) with Kyrgyzstan, and 379 kilometers (235 mi) with Turkmenistan. Major cities include Astana (capital since December 1997), Almaty (the former capital), Karaganda, Shymkent (Chimkent), Semey (Semipalatinsk) and Turkestan. The climate is continental, with hot summers and colder winters. Precipitation varies between arid and semi-arid conditions. The government of Kazakhstan plans to double its Gross domestic product (GDP) by 2008 and triple by 2015 compared to 2000. The GDP growth was stable in the last five years, and was higher than 9%. GDP growth in 2005 was 9.2%, and 9.4% in 2004. Kazakhstan's economy grew by 9.2% in 2003, buoyed by high world crude oil prices. GDP grew 9.5% in 2002; it grew 13.2% in 2001, up from 9.8% in 2000. Kazakhstan's monetary policy has been widely considered to be well-managed. Its principal challenges in 2002 were to manage strong foreign currency inflows without sparking inflation. In 2003 inflation did not remain under control, registering at 6.8% instead of the forecast level of 5.3%-6.0%. In 2002 inflation was 6.6%, compared to 6.4% in 2001. Because of its strong macroeconomic performance and financial health, in 2000 Kazakhstan became the first former Soviet republic to repay all of its debt to the International Monetary Fund (IMF), 7 years ahead of schedule. In March 2002, the U.S. Department of Commerce graduated Kazakhstan to market economy status under U.S. trade law. The change in status recognized substantive market economy reforms in the areas of currency convertibility, wage rate determination, openness to foreign investment, and government control over the means of production and allocation of resources. In September 2002, Kazakhstan became the first country in the former Soviet Union to receive an investment-grade credit rating from a major international credit rating agency. As of late December 2003, Kazakhstan's gross foreign debt was about $22.9 billion. Total governmental debt was $4.2 billion. This amounts to 14% of the GDP. There has been a noticeable reduction in the ratio of debt to GDP observed in past years; the ratio of total governmental debt to GDP in 2000 was 21.7%, in 2001 it was 17.5%, and in 2002 it was 15.4%. The upturn in economic growth, combined with the results of earlier tax and financial sector reforms, dramatically improved government finances from the 1999 budget deficit level of 3.5% of GDP to a deficit of 1.2% of GDP in 2003. Government revenues grew from 19.8% of GDP in 1999 to 22.6% of GDP in 2001, but decreased to 16.2% of GDP in 2003. In 2000, Kazakhstan adopted a new tax code in an effort to consolidate these gains. On November 29, 2003 the Law on Changes to Tax Code was adopted, which reduced tax rates. The value added tax fell from 16% to 15%, the social tax from 21% to 20%, and the personal income tax from 30% to 20%. Kazakhstan furthered its reforms by adopting a new land code on June 20, 2003, and a customs code on April 5, 2003. Energy is the leading economic sector. Production of crude oil and natural gas condensate in Kazakhstan amounted to 51.2 million tons in 2003, which was 8.6% more than in 2002. Kazakhstan raised oil and gas condensate exports to 44.3 million tons in 2003, 13% higher than in 2002. Gas production in Kazakhstan in 2003 amounted to 13.9 billion cubic meters (491 billion cu. ft), up 22.7% compared to 2002, including natural gas production of 7.3 billion cubic meters (258 billion cu. ft); Kazakhstan holds about 4 billion tons of proven recoverable oil reserves and 2,000 cubic kilometers (480 cu mi) of gas. Industry analysts believe that planned expansion of oil production, coupled with the development of new fields, will enable the country to produce as much as 3 million barrels (477,000 m³) per day by 2015, lifting Kazakhstan into the ranks of the world's top 10 oil-producing nations. Kazakhstan's 2003 oil exports were valued at more than $7 billion, representing 65% of overall exports and 24% of the GDP. Major oil and gas fields and their recoverable oil reserves are Tengiz with 7 billion barrels (1.1 km³); Karachaganak with 8 billion barrels (1.3 km³) and 1,350 km³ of natural gas); and Kashagan with 7 to 9 billion barrels (1.1 to 1.4 km³). Kazakhstan instituted an ambitious pension reform program in 1998. As of January 1, 2005, the pension assets were about $4.1 billion. There are 16 saving pension funds in the republic. The State Accumulating Pension Fund, the only state-owned fund, could be privatized as early as 2006. The country's unified financial regulatory agency oversees and regulates the pension funds. The pension funds' growing demand for quality investment outlets triggered rapid development of the debt securities market. Pension fund capital is being invested almost exclusively in corporate and government bonds, including Government of Kazakhstan Eurobonds. The Kazakhstani banking system is developing rapidly. The banking system's capitalization now exceeds $1 billion. The National Bank has introduced deposit insurance in its campaign to strengthen the banking sector. 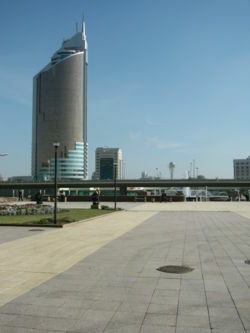 Several major foreign banks have branches in Kazakhstan, including ABN AMRO, Citibank, and HSBC. Kazakhstan has stable relationships with all of its neighbors and is a member of the United Nations, Organization for Security and Cooperation in Europe, Euro-Atlantic Partnership Council and Organization of the Islamic Conference (OIC). It is an active participant in the North Atlantic Treaty Organisation's (NATO) Partnership for Peace program. Kazakhstan is also a member of the Commonwealth of Independent States, the Economic Cooperation Organization (ECO) and the Shanghai Cooperation Organization along with Russia, China, Kyrgyzstan, Tajikistan, and Uzbekistan. Kazakhstan, Belarus, Kyrgyzstan, and Tajikistan established the Eurasian Economic Community in 2000 to re-energize earlier efforts at harmonizing trade tariffs and the creation of a free trade zone under a customs union. Since independence in 1991, Kazakhstan has pursued what is known as the multidimensional foreign policy (многовекторная внешняя политика), seeking equally good relations with two large neighbors, Russia and China, and the United States and the West generally. The policy has yielded results in the oil and gas sector, where companies from the U.S., Russia, China, and Europe are present at all major fields, and in the multidimensional directions of oil export pipelines out of Kazakhstan. Kazakhstan possesses the Soviet equivalent to the United States' Cape Canaveral, where the Soviet Union launched its version of the space shuttle and the well-known space station Mir. Russia currently leases approximately 6,000 km² (2,300 mi²) of territory enclosing the Baikonur Cosmodrome space launch site in south central Kazakhstan. In September 2006, the government announced that it is funding distribution of a multi million dollar movie called " Nomad" about the history of the nation. The movie started in 2003, and has been plagued with multiple development problems, though it is now 'on track' for release in 2006-2007. News reports erroneously suggested the government was sponsoring this movie as an effort to combat negative international publicity, including the satirical character Borat. In September 2006, President Nursultan Nazarbayev visited the United States, where he met with President George W. Bush at the Oval Office, several key members of the U.S. Administration and Congress. While in Washington, President Nazarbayev unveiled the Monument of Independence of Kazakhstan and addressed a large gathering of the political and business elite on Kazakhstan's approach to nuclear nonproliferation. The population is estimated to be 53% ethnic Kazakhs and 30% ethnic Russians, with an amazingingly rich array of other groups represented, including Ukrainians, Uzbeks, Germans, Chechens, and Uyghurs - that is, virtually any group that has ever come under the Russian sphere of influence. Many minorities such as Russian Germans, Poles, Romanians, Ukrainians and Russian political opponents of the regime had been deported to Kazakhstan in 30-ies and 40-ies of the last century by Stalin. One of the biggest Soviet labor camps existed in Kazakhstan. There is also a small but active Jewish community. Before 1991 there were one million Volga Germans in Kazakhstan; most of them emigrated to Germany following the breakup of the Soviet Union. The main religious groups are Sunni Islam, Russian Orthodoxy and Roman Catholicism. The small population of Hindus is persecuted. Recently, their temple was razed to the ground, ostensibly on the ground that it was illegal. The 1990s were marked by the emigration of many of the country's Europeans, a process that began in the 1970s; this was a major factor in giving the autochthonous Kazakhs a majority along with higher Kazakh birthrates and ethnic Kazakh immigration from the People's Republic of China, Mongolia and Russia. In the early 21st century, Kazakhstan has become one of the leading nations in international adoptions. For many years, Russians often outnumbered the Kazakhs in many parts of the area known today as Kazakhstan. Even now, Russians and people of other ethnic origins play an important role in the economy and government and consider the country their home. The Russian term казахстанец (Kazakhstani) was coined to describe all inhabitants of Kazakhstan, including non-Kazakhs. The word "Kazakh" is generally used to refer to people of actual Kazakh descent (including those living in China, Afghanistan, and other Central Asian countries). Ethnicon Kazakh is derived from an ancient Turkic word “independent, a free spirit” and fully reflects the nature of the Kazakh people, who have been in all times aspiring to an independent, autonomous existence. It is the result of Kazakhs' nomadic horseback culture and is related to the term " cossack". The Avestan/ Old Persian (See Indo-European languages) word "stan" means "land" or "place of". Education is universal and mandatory through to the secondary level and the adult literacy rate is 99.5%. Education consists in three main educational phases: primary education (forms 1-4), basic general education (forms 5-9) and senior level education (forms 10-11 or 12) divided into continued general education and professional education. (Primary education is preceded by one year of pre-school education.) These three levels of education can be followed in one institution or in different ones (e.g. primary school, then secondary school). Recently, several secondary schools, specialized schools, magnet schools, gymnasiums, lyceums, linguistic and technical gymnasiums, have been founded. Secondary professional education is offered in special professional or technical schools, lyceums or colleges and vocational schools. At present, there are universities, academies, and institutes, conservatories, higher schools and higher colleges. There are three main levels: basic higher education that provides the fundamentals of the chosen field of study and leads to the award of the Bachelor degree; specialized higher education after which students are awarded the Specialist's Diploma; and scientific-pedagogical higher education which leads to the Master's Degree. Postgraduate education leads to the Kandidat Nauk (Candidate of Sciences) and the Doctor of Sciences. With the adoption of the Laws on Education and on Higher Education, a private sector has been established and several private institutions have been licensed.